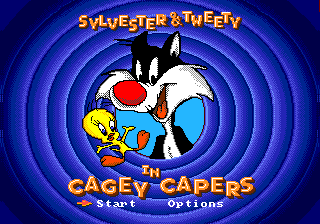 Sylvester and Tweety in Cagey Capers is a sidescrolling action game for the Sega Mega Drive. Sega Master System and Sega Game Gear versions were planned (the latter appearing at Summer CES 1993), but were cancelled for unknown reasons. Special Thanks: Our Friends and Significant others, let's spend some time together now. Filmed entirely on location in Los Osos, California. All animals in the production were treated in a humane fashion. Main article: Sylvester and Tweety in Cagey Capers/Magazine articles.